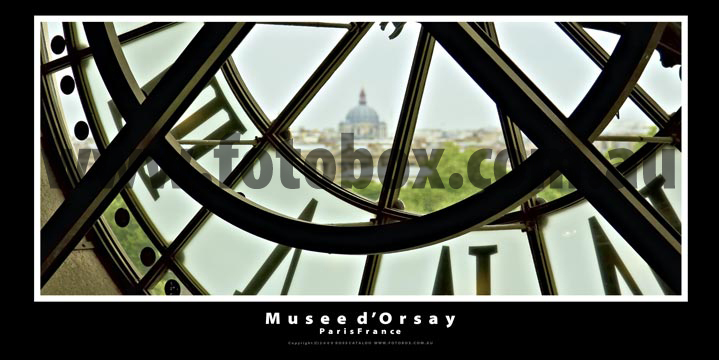 Image Information " The Musée d'Orsay is a museum in Paris, France, on the left bank of the Seine, housed in the former railway station, the Gare d'Orsay, an impressive Beaux-Arts edifice built between 1898 and 1900. It holds mainly French art dating from 1848 to 1915, including paintings, sculptures, furniture, and photography, and is probably best known for its extensive collection of impressionist and post-impressionist masterpieces (the largest in the world) by such painters such as Monet, Manet, Degas, Renoir, Cezanne, Seurat, Gauguin and Van Gogh. Many of these works were held at the Galerie nationale du Jeu de Paume prior to the museum's opening in 1986. The museum building was originally a railway station, Gare d'Orsay, constructed for the Chemin de Fer de Paris à Orléans and finished in time for the 1900 Exposition Universelle to the design of three architects: Lucien Magne, Émile Bénard and Victor Laloux. It was the terminus for the railways of southwestern France until 1939.By 1939 the station's short platforms had become unsuitable for the longer trains that had come to be used for mainline services. After 1939 it was used for suburban services and part of it became a mailing center during World War II. It was then used as a set for several films, such as Kafka's The Trial adapted by Orson Welles, and as a haven for the Renaud-Barrault Theatre Company and for auctioneers, while the Hôtel Drouot was being rebuilt. The station's hotel closed on 1 January 1973"